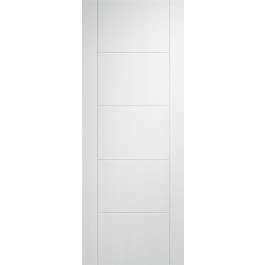 35mm engineered solid core flush non-fire rated internal white primed door with 5mm vertical and horizontal v-grooves creating a flush 5 panel effect door design. Supplied white primed ready for on-site finishing. Available in standard imperial sizes with 10 years manufacturing guarantee. Contemporary double primed interior white door with a grooves pattern creating a 5 panel effect. Wide range of imperial sizes available as well as matching fire and glazed models.